Watching my daughter turn 17 this past week, I realize she has developed a lot of the same characteristics as I possess (all GOOD traits, needless to say). Unfortunately, she has also inherited a certain er, let's call it "idiosyncrasy" from hubby's side of the family. Yes. Good characteristics from me. Idiosyncrasies from him. My blog. My opinion. 0100: Being the weekend, the entire family hit the sack quite late. 0215: Because I am a notoriously light sleeper and/or the "Mom Instinct" kicked in, I awoke when daughter got up to use the bathroom. Fearing the flu had hit yet again, I heard her shuffling around in the medicine cabinet. 0230: Seemingly fine, she returned to her bedroom for the rest of the night. Sometime later I finally drifted back to sleep, reassured she was okay. In the morning I was already awake (and yes, at the laptop blogging as usual) when daughter emerged from her room looking confused. She told me she remembered taking out her contacts before bed last night, but when she got up, they were back in again. She had no memory of getting up in the middle of the night. She had no memory of putting in her contacts. 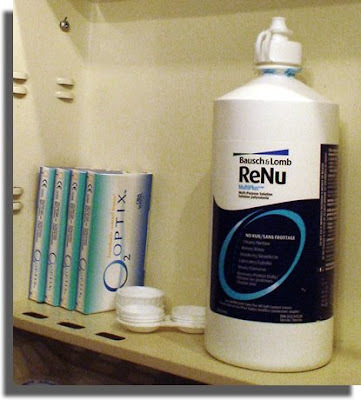 She had no memory of placing all her supplies back in perfect order in the medicine cabinet. Yup. She was sleepwalking last night. So when hubby finally awoke, I blamed him. For you see, his mother has often recited stories of family sleepwalkers. Thanks dear. Thanks so much for that contribution to the gene pool. LOL!, I always blame the oddities in my daughters on their fathers genetics. I know for a fact that all of the good stuff came from my side. Ha, ha! I used to be a sleep walker as a kid and then did it again for a while as an adult and got food to eat from the kitchen, which I then found half eaten in the bed in the morning. Lots of crumbs in the bed and an unbelieving husband. Luckily, I am over that now. Sleep walking is one of those things I find fascinating and a wee bit frightening. Hmmm, I wonder if she saw her dreams any clearer ... ? Oh I do this. I used to get up and get totally dressed for school and be walking out the back door for the bus...at 3 AM. I kept my mom on her toes. Now my husband gets to deal with my nighttime wanderings. Elevated when I am stressed which is all the time nowadays. Lucky him. That is crazy. I've never known anyone who sleptwalk. Does it make you nervous? Wow, that is amazing! My friend's 6 year old sleep walks and she's a bit freaked out by it. He usually goes to the washroom in his sleep (ie. thinks he's made it to the toilet, but doesn't really). She's had to lead him to the washroom when she catches him sleepwalking so she doesn't have a big mess in the morning everytime he's sleepwalking! I've always said all the good stuff comes from my side and all the annoying pain-in-the-neck stuff comes from hubby's side! We've experienced night-terrors but never sleep walking. Nora: I do hope she outgrows it too. However, I have to laugh at the image of half-eaten food in your bed! Kathy: I'll have to ask her! Vegas Princess: That's just like what she was doing; I think she thought it was morning and she was getting ready for school! Weird. ShannanB: No, I'm not nervous... but I am going to make sure I pay more attention when I hear her get up in the middle of the night! Karen Meg: Yikes! Thank goodness THAT doesn't happen!! Heather: Yeah, that WOULD be freaky; especially in the middle of the night! KSD: Luckily, this is a rare thing; and thank goodness no screaming! Oh man - I wish ****I**** could learn to clean in my sleep!!!!!!! Putting in contacts doesn't seem nearly as practical, but..y'know...guess she was ready freddy in the morning!!!! Hm, I would think sleep-cleaning would be kind of cool. Your house is clean but since you don't remember doing it, it sort of feels like you had a maid come in and do it. Sleep-contact-inserting seems an especially cool "idiosyncracy." Did she get each one in the correct eyeball? I'd feel gypped if I awoke to discover I'd been sleep-cleaning. To really feel the satisfaction the job, I must remember doing it! You too?? I would stake money that my daughter's bad habits all come from my hubby's side of the family. How odd to meet someone with the same problem as me! Ha! Wow...I think I'd be hoping she'd do my whole house! Talk about paying attention to detail! That is the most well-organized medicine cabinet I've ever seen! Tell her to sleep walk over here and get to cleaning! That's an opportunity knocking! I say put that sleepwalking to good use...leave the vacuum out! I thought sleepwalking only happened in the movies or on cartoons. Jill: It was so funny, really... she comes out of her room wondering why the heck she could see so well, as they are strong prescriptions so it is easy for her to tell when they are in! Pand0ra Wilde: Yeah! Especially if my daughter did it for me! Stephanie: Ha! See? I do believe in my non-scientific poll that the wives win by a landslide; we DO pass on the good qualities in our kids. Creative-Type Dad: Nope, it happens IRL too... as long as she doesn't grab the car keys in the middle of the night, I can deal with it. Canadian Flake: I know! We were dying laughing in the morning. It was weird, but oh so funny at the same time. Of course I had to ask her permission to blog about it! My son Austin is a sleepwalker. We often have to corral him back to bed when we find him wandering around in the middle of the night. When he was very little (around 4) we had to be really quick because he would think various things were the toilet, and we'd often find him with his pants down getting ready to pee in the garbage, or flower pot, or toy box. I think the courts have ruled that you can't be held liable for anything you do while sleep walking......hope she dosen't become a serial killer or a burglar. Jeff: Oh Yikes!!!! I'll take putting in contacts over random midnight peeing anyday!! Lady Banana: Yeah, it was unique all right!!! How funny!! I knew someone who would get up and eat everything in the fridge in the middle of the night and remember nothing. I also have been told I sleepwalk from time to time. Matt said one night I got up and sat on the nightstand and stayed there a while. hehe. I wish I'd clean in my sleep, too! Which reminds me, I think I'll need to keep the camera at the ready the next time daughter gets up in the night!